The market leader in Rugged Computing Solutions in India for Field and Extreme Environments. 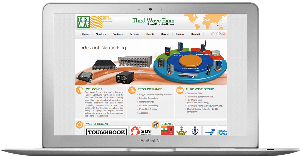 Third Wave Exim ( Rugged Computing Division ) is the market leader in Rugged Computing Solutions in India for Field and Extreme Environments. Having more than two decades of expertise in providing innovative and rugged mobile computing solutions that achieves real benefits for their business operations, and having a group of highly qualified technocrats with sound business acumen and strong technical skills. Third Wave Exim depends on a growing set of business partners to help deliver products and solutions to customers. Customer needed new concept in CMS website. We developed concept jointly with customer. Centre for Foundry Education & Research has been set up under the auspices of Gujarat Foundry Industry, Industries Commissioner, Govt. Of Gujarat and Development Commissioner, Ministry of Micro, Small and Medium Enterprises, Govt. of India. CFER is providing testing facilities, technical training for staff, managerial training to entrepreneurs and arranging customer-buyer meets to empower SME foundries. Centre for Foundry Education & Research was redesign order. Their previous website was having all the information but was not pleasant. We focused on CFER’s core strengths and made corporate layout with new color scheme. CFER is dynamic organization. Regular update about training program and news letter were main concern. We gave easy interface to edit website. Customer is regularly updating website without our help. So, we say it is maintenance free website. This entry was posted in Service Provider's Website on November 25, 2015 by admin. Maxwell Compressors is one of the leading industrial compressor manufacturer and exporter based at Ahmedabad, Gujarat, INDIA. Maxwell is focusing on after sales services and refurbishment of compressors and ensuring minimum downtime of the production as well as processing units. Maxwell was newly established organization when they came to us for web solution. Our team jointly did brain storming meetings with partners of Maxwell and fixed focus of the website. Our team extended our support by collecting sample data of the same type of businesses for customer to make the whole process easy for customer. Maxwell is serving to corporate companies. So, simple but attractive design was compulsory. Logo’s color was red and navy blue. First challenge was using both colors along with corporate look. We followed color scheme of logo and gave pleasant looking design for website. Customer was satisfied with first layout! In short time of publishing website, customer got good feedback. That was our winning edge too. Beauty with functionality is our moto for website design. It again proved in this project too. Maxwell got list on first page of google with in just one week. This entry was posted in Manufacturer's Website, Service Provider's Website on November 25, 2015 by admin.